SaltStack speed and simplicity cited in Bossie Award 2013 win in the category of data center and cloud software. What's important when managing massive numbers of servers? Speed and simplicity. SaltStack achieves both in solving the two biggest problems in server management: remote command execution and configuration management. As the InfoWorld staff picked the top products in open source data center and cloud platforms, infrastructure, and management tools, Peter Wayner, InfoWorld Test Center contributing editor wrote that the Bossie Awards, “focus on an increasingly important layer, the one that keeps all of these machines in the cloud in line. SaltStack provides flexible, easy-to-use software for real-time infrastructure automation and application stack configuration management. SaltStack is known for its speed and its ability to scale unmodified to support environments with tens of thousands of systems with no performance or functional degradation. SaltStack is used by systems administrators to provision, orchestrate and manage any physical, virtual or cloud environment. SaltStack is unique in providing enterprise software for remote system execution together with configuration management built specifically for modern data center infrastructures. SaltStack takes a programmatic, common-sense approach to server infrastructure configuration and automation. SaltStack is written in Python, utilizes easy to create and read YAML for configuration formulas, and works in a push or pull model with intelligent masters and minions for flexible, dynamic, real-time automation. Join SaltStack customers, users, developers, core engineers, and partners at SaltConf, the annual SaltStack user conference, from Jan. 28-30, 2014 in Salt Lake City. A call for speakers is now open. More details can be found at http://www.saltconf.com. 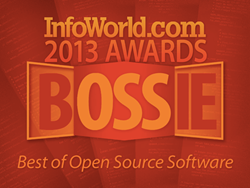 *InfoWorld.com, “Bossies 2013: The Best of Open Source Software Awards,” Peter Wayner, Sept. 17, 2013, http://bit.ly/19wHdgO. **InfoWorld.com, “Bossie Awards 2013: The best open source data center and cloud software,” Steven Nuñez, Sept. 17, 2013, http://bit.ly/1eRHrIb.